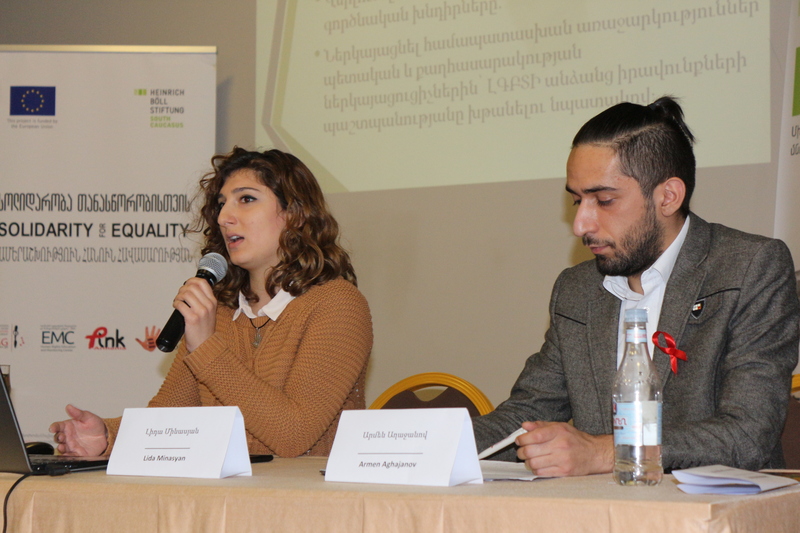 On December 2, 2016, the Heinrich Boell Foundation South Caucasus Regional Office, together with its partners, the NGO Public Information and Need of Knowledge (PINK) and Society Without Violence (SWV) organized a presentation of a comprehensive LGBTI rights strategy document, titled “Realising the Human Rights of LGBTI People in Armenia”. 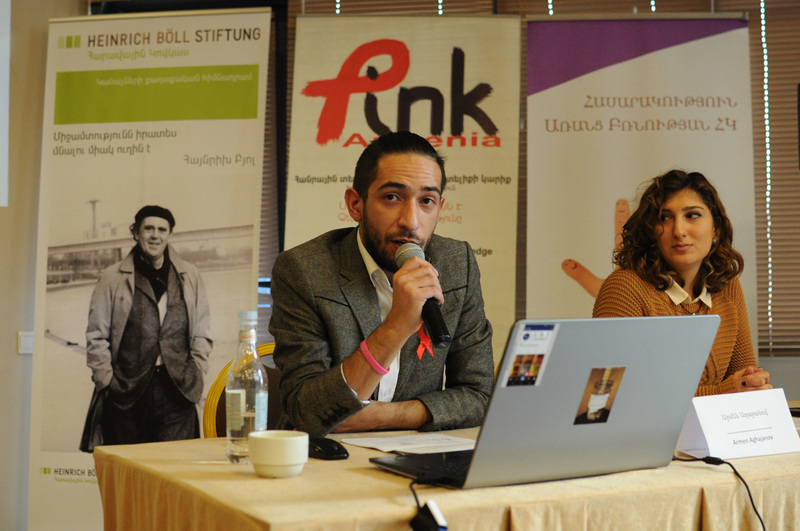 The document constitutes an evidence-based strategy stemming from the recommendations of two unprecedented studies conducted by PINK Armenia and SWV earlier this year, which explore homo/bi/transphobic societal attitudes in Armenia and analyse the legal situation of LGBTI persons in the country. The strategy was developed in a multi-stakeholder participatory process involving numerous official and unofficial meetings among key stakeholders from local non-governmental human rights organizations, diplomatic missions, media, representatives of the Human Rights Defender’s Office in Armenia, and LGBTI community members, the latter being integral to the process in order to ensure that the strategy is oriented towards issues that are relevant to LGBTI persons and their full integration into society. The document was compiled by a human rights lawyer and expert Gabriel Armas-Cardona, and includes guidelines for the establishment of specific and targeted working groups aimed at tackling short-term, medium-term, and long-term issues, including hate crimes/speech, economic empowerment, legal support, social education and the consolidation of the LGBTI community in Armenia. The working group format is aimed at affording the participating stakeholders maximum ownership of the solutions to the current problems that the LGBTI community is facing in Armenia at present. 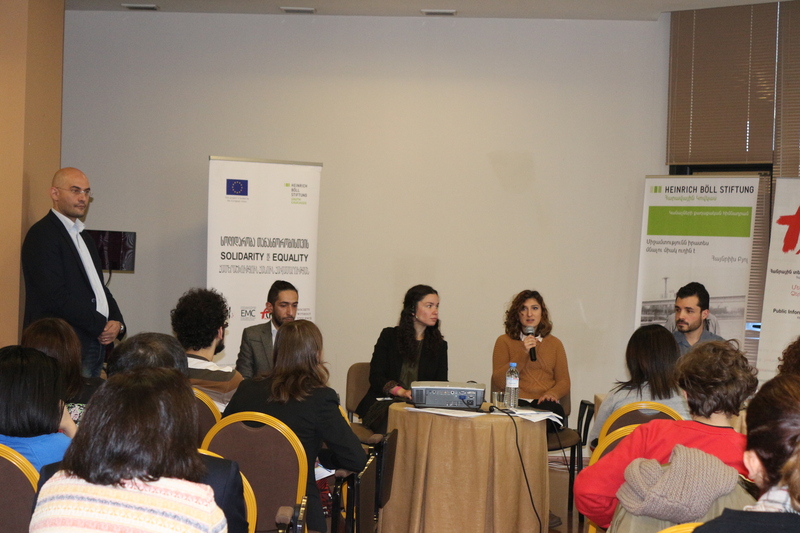 The official presentation of the strategy document was opened by Anne Nemsitsveridze-Daniels, Project Coordinator of the EU-funded initiative, who gave a brief description of the general activities and areas of work of the South Caucasus Regional Office of the Heinrich Boell Foundation, as well as information about the EU-funded project, which is implemented simultaneously in Armenia and Georgia. Line Urban, International Aid/Cooperation Officer of the EU Delegation in Armenia then spoke about EU’s commitments to the advancement of human rights in the country, several key agreements between the EU and the Government of AR, as well as plans for the future and the significance of observing LGBTI human rights as a whole. 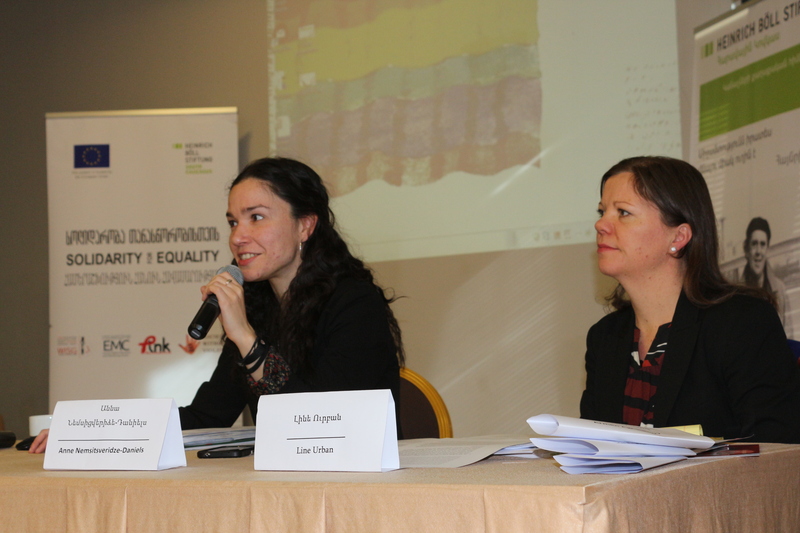 The floor was then taken by Armen Aghajanov of PINK Armenia and Lida Minasyan of SWV, who presented the key findings of the two comprehensive studies conducted within the project. Following the presentation of the studies, the author of the strategy document, Gabriel Armas-Cardona proceeded to offer a detailed breakdown of the document, its structure, purpose, and the possibilities it offers in making steps towards tackling LGBTI-specific issues. The presentation, which was facilitated by Hovhannes Madoyan of the Human Rights House Network, was concluded with a Q&A session, where participants wondered about the mechanism for joining and implementing the targeted working groups described in the strategy document, declaring the “application period” open for any interested stakeholder. Despite security concerns, the bulk of the event was conducted without incident, and it is essential to note that on request of the Heinrich Boell Foundation, the RA Police ensured effective presence on the scene and neutralized several attempts to infiltrate the venue by unauthorized persons. Following the presentation of the strategy document, the project team will develop a specific Action Plan according to which they will lobby key authorities and relevant entities and seek a degree of endorsement of the proposed strategy and offer cooperation to jointly overcome challenges. 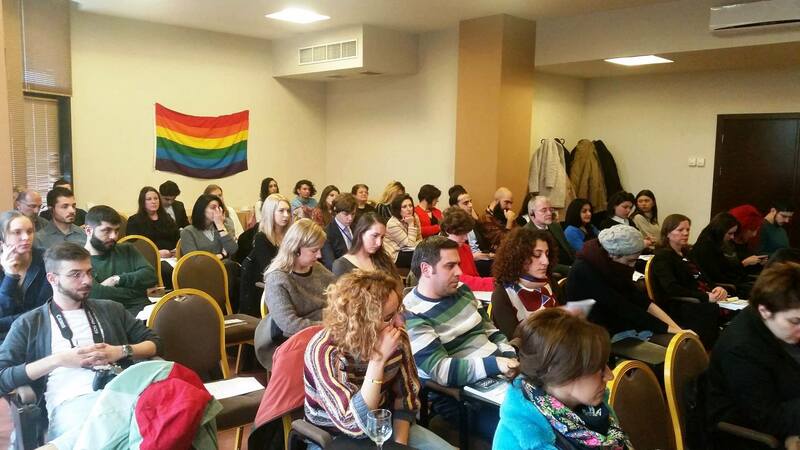 The two studies mentioned above, as well as the strategy development process were conducted within the framework of a three-year cross-border EU-funded project Solidarity Network for LGBTI in Armenia and Georgia.